The Minnesota High School Music Listening Contest is sponsoring a $500 Scholarship Essay Competition to help further the post-secondary education of an MLC participant. 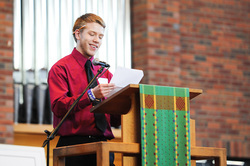 ​The competition is open to any high school senior who is currently participating in the MLC. Select a piece from this year’s Study Guide and write a 500-750 word reflection connecting elements of the piece and/or composer’s story to your life. Entries must be received by Jan. 26, 2018. Winner will be notified before the Championship competition in February 2018. ​By submitting the essay, I certify that the accompanying essay is my own work. I agree to accept the decision of the MLC Scholarship Committee as final. I understand that all submissions become the property of the MLC and I agree to the use of my name and essay for promotional purposes without written consent or compensation. As a recipient, I authorize release of my name and/or likeness to the media to be used, where legal, for publicity purposes. I understand that taxes on the award are the sole responsibility of the recipient. When I first heard Polska efter Hins Anders, I was immediately transported back in time. I listened intently to the rhythmic variation, and smiled despite myself. Ah, yes. This was the music of home. The sound of the fiddle, recognizable to me with not quite as poignant of a sound as the Norwegian hardanger fiddle, swelled a tune of a summer dance. I had danced many a midsummer dance to that sound. In fact, just over a year ago, I danced through the hollows of an old church town, finding my way by the sound of a fiddle playing a similar summer polska at the front of the town. If ever there was a song to study that unexpectedly stole my heart, it was this one. My life started out relatively disjointed. Like the Polska’s inability to fit the mold of most traditional fiddling tunes, my early childhood didn’t fit the mold of most my age. Born in the Ukrainian-Crimean city of Yevpatoria and left at an orphanage in Simferopol at an unknown date, the first fourteen months of my life are a mystery to this day. Blessedly, I was adopted at fifteen months and brought into a new family, where my love for music flourished and my connection to my original culture fractured. The glue that managed to hold me together, however, was my innate need to find new music to connect to. I found this in the traditional folk music of the landskap of Dalarna, in Sweden. I was lucky enough to be adopted into a family whose culture matched one that I myself could connect to. Most adopted children are not that lucky. My adoptive grandfather was one-hundred percent Swedish; my grandmother split evenly Norwegian and German. Physically, Scandinavian heritage is not in me --- but it surrounds my life and I live within the culture and the music of it every day. It is as a result of this that I am in Svenskarnas Dag Girls’ Choir. With this choir, I spent a month touring Sweden the summer of 2015. Traveling the country singing made me exceptionally aware of the way in which different provinces have their own distinct style of folk music. To those that know Dalarna well, Polska efter Hins Anders practically shouts Dalarna’s culture from the top of Torsangs’s Church. I was asked to be a part of my school’s Music Listening Contest team solely because of my knowledge of Scandinavian music. Initially, I thought it would be easy. Perhaps memorizing a few facts and identifying the provinces from which certain Swedish folk tunes originated. I could not have possibly imagined just how much more I would get out of the experience. Through studying the varying traditions of the different Scandinavian countries, and delving further into the facets of Polska efter Hins Anders, I was able to see that though I thought I knew most everything about traditional Scandinavian folk music, I really had only scratched the surface. I studied. I learned about how the uneven rhythms of the polska are intentional, and harken back to the earliest days of folk music. I learned that for most polskas, there is no exact written music-fiddlers embellish as they wish. I learned that the music I heard in northern Sweden was actually not Swedish, but an adaptation of Norwegian fiddling. I learned that during Midsummer, dulcimers can often be substituted for accordions- something I had not witnessed on my trips to Sweden. As a young adult preparing to enter the ‘real world’, it is comforting to know that there is always something new to learn. As Music Listening Club has taught me, It is a gift to be surprised by new information; and a gift to learn about myself through that information. To listen to music is to learn, and to learn is to add another puzzle piece to one’s life. Polska efter Hins Anders is special to me because it exemplifies a puzzle piece that filled the gap of my first fifteen months of life. I am delighted to have spent such a time learning more about the music of a culture that I have clinged to so desperately during my youth, and I am deeply thankful to realize that there is still more to learn. For, just like the constantly repeated sections of folk polskas, there is always more ahead. And there is always more to dance to. There are moments in life where one feels like the world is crashing down around them. Things start building up and there's too much to do and too little time. In the third movement of Ravel’s “Piano Concerto in G Major,” one can feel their life speeding through the pianist’s fingers and hear every one of their obstacles in the dramatic interjections from the orchestra. Add in Ravel’s fondness for odd chords and unexpected melody lines and you have a musical representation of life. Sometimes during high school, there’s a feeling of being pulled along by one’s mentors and parents instead of establishing one’s own path and melody. This is reminiscent of the passages where the orchestra carries the melody. Despite the switches in control, the piano always swoops back in and takes over the melody. Everyone at some point must leave their parent’s basement and go out into the world to make their own journey. Throughout the piece, the melody line slowly develops and has a more distinct direction on where it’s going. At the beginning of my life I wasn’t sure where I was headed but as I’ve gone along, I’ve slowly figured things out and made my way. Life isn’t always clear cut but by forging ahead and conquering the obstacles, one can make a beautiful piece of music. This piece is supposed to be played as fast as the pianist can play it. It seems to me that this resembles how much a person can handle in life. If one can handle doing ten activities at once, then they take them at that speed whereas the ones who can only take on three or four activities at a time are allowed to slow it down to a bearable speed. Like the flurry of notes from the piano, my life whizzes by. Especially during my senior year the days seem to go by even faster. Just like Ravel’s tonal shifts, my life shifts from one activity to another. I go from preparing for the school year to preparing for college scholarship auditions to deciding on a college. Yet no matter where I am on that journey, I can always hear the melody that’s leading me in the direction I need to go. Music has guided and shaped my life in so many ways. It has led me in the direction I have needed to go and taught me what’s important in life. Through my many years of music classes and activities, I’ve learned the importance of dedication and perseverance. When I start a tough Chopin waltz, I know exactly the tools I need to learn it. I keep working on the hard sections despite my frustration level and focus on the feeling of success I will have when I master it. Through my ensembles and Music Listening Contest, I have realized that teamwork also plays a crucial part in success. If the individuals never learn to work together, their goals will be much harder to achieve. This then shows the characteristics needed for an enjoyable life. No matter how hard or fast things seem to be moving, the concepts of music are ever guiding and will lead us to our eventual goal. Cordier's Tout Par Compas is a musical puzzle in which there is a balance in parts yet disorder in the composition leading to finality. We follow the instruments through a path and, in order to get to the end, you must choose your direction. In my life I have found that I have many hard choices to make in which I must pick an avenue to head towards. With strong guidance and belief in myself, I am able to do anything I put my mind to. In the past year I have had to start planning my future by balancing eight classes, college/ scholarship applications, and a job. Cordier's, Tout Par Compas (With A Compass) is an accurate representation of the recent activities in my life. The three distinct parts represent all the different things seeking my attention whether that be positive or negative. With each part comes a different direction that represents temptation to follow roads that may not get me where I need to go, the most common place being in front of the television. Unfortunately, Grey's Anatomy is not going to help me better my education. The polyphony has an organized chaos making it easy to get lost. That's exactly what Cordier intended, you have to be lost in order to be found. That is where I caught the message of the piece: follow your compass or follow the path that best suites you. While I have been lost trying to determine the decision on the college I want and what I wish to go to school for, I have been moved by Cordier's unspoken advice that I need to make a choice based on my needs and my interest rather that what pays the most. Guidance from those who know me, teachers, parents, and friends, has allowed me to narrow down my options significantly. The intertwined parts eventually come to an end giving us the point of finality. As I come to the last notes, just as I come to the end of my senior year, I realize there has been one clear path all along. It's just taken awhile to find. Although I don't know exactly what I want to do with my life, I know I want to do something involving music. Up until now I have used high school to guide me which has led me to unearth my love for songs and their compositions. In college I look forward to fine tuning my musical career and improving my skills that I have developed. The constant fluctuations, in which I face, similar to those in the piece, will have a destination that I will always be able to reach. Whether it's the 1400's or 2015, everyone has a journey to embark on, myself included. As I grow older and have to juggle more notes in class or following paths to different locations I realize there will always be distractions and barriers to get over but I can always do what I put my mind to if I just follow my compass. “Music, like life, is the contrast between dissonance and resolution.” These words were spoken to me during the sermon of a college Lutheran church service this fall on a visit to a prospective school. The sermon had directly followed a transformative performance of a choral motet by the school’s top choir and that sentence seemed to fittingly describe both the music I had just heard and also my personal quest of why I was on the visit. But, those words quickly were forgotten after the service ended until they suddenly reappeared in my mind a few months later, as soon as I heard the first sounds of Brahms’ “Shaffe in mir” in preparing for this year’s Music Listening Contest. For weeks, I couldn’t get either the quote or the haunting chords of the music out of my head. I knew that it had reappeared in my life for the purpose of connecting me to the music’s story while giving me perspective on my own life. The more I listened to the Brahms motet the more I fell in love with its lingering beauty and noticed not only the unfolding detail and genius behind the composition, but also how appropriately that quote fit both the piece and Brahms life. Dissonance and resolution is foundational in both, and after completely understanding the piece I felt I could understand how these elements formed my own experiences also. The sophistication of “Shaffe in mir” specifically uses the contrast between dissonance and resolution to bind it together, and to mirror the Psalm 51 text that describes familiar Lutheran doxology. Each gorgeous chord captures your interest and resolves into something else, as the rise and fall of the opening of the first section establishes a warm, prayerful tone. This quickly changes as the chromaticism of the fugue in the second section creates conflict between major and minor keys, mirroring the distress and dissonance related in the text. The piece is completed by Brahms restoring the first warm canon we heard and then ending it spiritedly. These musical elements all fit perfectly with the feelings Brahms was trying to portray, but one can only imagine that the sophistication of the specific elements of resolution and dissolve he uses stemmed from his own experiences. Brahms himself battled dissonance throughout his life. During his musical career he constantly fought against the dichotomy of his own expectations versus others. Still frustrated he hadn’t written a symphony at forty he composed his first which was unfortunately dubbed “Beethoven’s tenth.” He was composing in a time where the comparison was Beethoven and the establishments of previous musical opinions were changing. Brahms also faced personal dissonance such as the death of his close friend Robert Schumann. Afterwards, he tried to comfort Robert’s wife Clara causing their relationship to deepen to the point where Brahms secretly but unfruitfully loved her until his own death of cancer. Contrasting these personal and professional dissonances Brahms faced many successes during his life including several long years of musical productivity and a strong international reputation. Brahms is remembered today as one of the most prolific composers of the romantic period and his skill can be clearly seen in “Shaffe in mir”. After understanding how this piece was composed and what Brahms faced during his own musical journey, I saw how that quote so appropriately came into my life. I too have faced both musical and personal dissonance including having to conquer medical issues, facing the loss of friendships, and falling short of numerous musical goals and accomplishments. But these are just the tensions that had to happen in order for me to also enjoy the beautiful resolutions in my life. The words of the pastor that day ring true as ever as I’ve realized that dissonance and resolution complement each other perfectly and that you cannot have one without another. As I reflect on the part of my life that will soon end and the unknown journey I’ll continue I’m excited to face anything because I know that even when it’s tough something better is just around the corner. Brahms own life and “Shaffe in mir” is a gorgeous allusion to this principle and so poignantly supports the idea that both life and music are beautiful and complete only with dissonance and resolution. Music has always been an integral part of my life. As a child I would fall asleep to my parents' lullabies, enveloped by the sense of safety and comfort only a mother’s voice can provide. In the third grade my dad played me “Octopus’s Garden,” precipitating a decade of personal Beatlemania and inspiring a series of mop top haircuts that made me feel as if I was one of the Four; I felt connected to John, Paul, George and Ringo. Then classical struck. I fell in love with Bach, Beethoven, and the rest, listening to symphonies and sonatas, concertos and solos. I simultaneously picked up the cello, wanting more than anything to play Bach’s first Cello Suite as passionately and as poignantly as Ma. By the time I was ten my thirst for music had surpassed my love for dinosaurs, Tonka trucks, and videogames. Seven years have passed since I scratched out my first notes on the cello, and I appreciate it now more than ever. Furthermore, classical music, in particular, remains a main source of my interest in the performing arts. Because of this passion I joined the music listening team at my high school three years ago, hoping to somehow increase my understanding of music. And music listening has certainly done that for me—I’ve confirmed my deep-seeded appreciation for music and come to admire composers not just for their tremendous brilliance with the quill, but also for their incredible lives and unique personalities. For me, however, my participation in the Minnesota High School Music Listening Contest has most affected my understanding of music. I’ve come to view it as a scintillatingly powerful force capable of inspiring emotion and creating energy. But I recognize that this sounds rather abstract and “off the beaten track,” and so I will clarify. Before this listening program, music represented something conceptual to me. I would listen to a musical piece and hear the notes, content to engage on a surface level with the sounds I found so appealing—I didn’t delve into the history of any particular piece, and certainly didn’t consider the circumstances which led to the composition of particular pieces of music. In retrospect I listened to music as most people do. And for me it was enough—at least until music listening. Once I began flipping the pages of the study guide my sense of music changed. I began to appreciate a piece of music for both its tonal qualities and for its story, a perceptive shift that in turn influenced my reaction to music. For example, knowing that Haydn wrote his 91st symphony under immense pressure to please the English strengthened my reaction to the work. I identify with the type of pressure he faced in addition to enjoying the symphony as fine art, thus making his work significant in more that one respect. And this reflects my previous statement concerning my understanding that music inspires emotion and creates energy. Listening to Mozart’s “Concerto for Two Pianos” after learning that he wrote the piece for his sister, for example, allows me to feel the emotion the music conveys; I can sense the energy, excitement, and interplay. I can also talk about it with other people on my team, discussing their reactions to the music and learning to view music from different perspectives. In this respect music listening has enhanced my experience with music. And although these heartfelt feelings which music listening has enabled me to experience are often ephemeral, the lasting effect they engrave on my spirit makes the hours of study and concentrated listening worthwhile. I know that I will be listening to music for the rest of my life, and find the prospect exciting particularly because of the way music listening has affected my music experiences. For that I am grateful. J.K. Rowling’s fictional wizard, Albus Dumbledore expresses his feelings on the importance of music in this line, “Ah, music. A magic beyond all we do here!" His views reflect my own: music is the most powerful form of human expression. I have felt this power throughout my three years of involvement in Music Listening Contest. 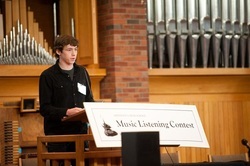 Music Listening Contest has allowed me to experience and understand music at a deeper level. It has exposed me to and made me appreciate many kinds of music that I never dreamed I would enjoy. Most importantly, Music Listening Contest has helped me develop a life­long love for classical music. I think it is interesting that although music is not a language, we can understand what a composer is saying by the sound of his music. I believe that this happens not when we are just listening to the music, but when we are experiencing the music. Music Listening Contest, in my opinion, opens doors to these experiences in music. Also, I feel that the information in the listening guide has helped me understand music at a deeper level. Dates, nationalities, biographies, and histories of the songs and composers all have helped me to better understand the motives behind and within the music. Each time I listen, these details help me to dive a little deeper, to apply my knowledge, and to experience more fully the power of the music. Before my involvement in Music Listening Contest, I never thought that I would one day be turning on my iPod and listening to music like Indian Carnatic music or Gregorian Chant. After a few years with Music Listening Contest, I find this happens very frequently and I think it really shows how much I have come to appreciate the diverse selection of music that is featured in our listening guides. Because of this, I have a taste for unique and uncommon music that I want to share with everyone I meet. Through this program, I have not only been exposed to eclectic music but also the “classics” of Western music. These pieces have had a dramatic effect not only the world but also me because it moves me. 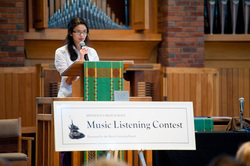 I often wonder what my life would have been like if I hadn’t been in Music Listening Contest. I think traveling would be a lot more boring and confusing because my family frequently listens to is Classical MPR in the car. Now after studying, I feel like I can identify with it. On a larger scale, I think the biggest thing that I would lack would be a life-long love of classical music. If I had not developed this love, I would not be as inclined to major in music education. Because of this program I understand a great deal about classical music and this comprehension has made me want to listen classical music for the entirety of my life. This gives me reason to say that Music Listening Contest is one of the most important experiences of my high school career and for that I am glad I didn’t live a life without it. It could be said that music is useless. That it is nothing more than a collection of enjoyable sounds that serve no purpose in the functioning of our world, and that it is unimportant by nature. There was a time, not so long ago, that I myself possessed these notions. I refused to accept the possibility that mere sound could be used as a means of expression to rival the writing or visual art; to me, music was entertainment, and nothing more. How could it be anything else? My perceptions changed radically last year, after my orchestra conductor required that I, along with other students in our class, participate in the Music Listening Contest (MLC). This change was not immediate, as at first I had no intention whatsoever of putting effort into the seemingly inane job of memorizing obscure facts about irrelevant composers--my study guide spent many happy weeks buried under a pile of old math homework assignments, somewhere deep in the minefield that is my room. which had resulted in my sitting in the garage and crying for three hours straight, that I happened to return to my room and uncover my copy of the MLC study guide. I opened it, thinking to distract myself from earlier events, and popped a CD into the disk player of my computer. The first track was a medieval song about crickets that I found very strange, so I picked another song at random. Track 5. A German lied by Schubert, about love, and loss, and despair, and regret. I knew nothing of course, nothing except the sounds -- the low, mournful voice of the singer, the soft piano accompanying him. I inhaled sharply, and could feel my spine tingling -- some creature that had, until now, lain dormant inside me lifted its head and began to purr as I realized -- I was listening to my experience with my mother. And, for some reason, where writing novels in my journal and walloping the backseat of my father’s car had not done me an ounce of good, this song, Erster Verlust, made me feel better. This single incident sparked my interest in the MLC, as I felt a burning need to know why such a simple piece had made me feel the way it had. Thus, I immersed myself in the contents of the study guide and began to learn that music is far more than a source of entertainment -- it is a means by which humans document the emotional aspects of their existence. From the gritty sounds of Shostakovich to Fauré’s sweet melodies, all music written with sincerity depicts certain feelings held by the composer that are passed on to anyone who might choose to listen. Through sound, a connection forms, between the composer and all the people who experience and relate to the composer’s music. My own heightened understanding of music’s origin and composition has both allowed me to discover the world of music for myself and helped me feel more connected with my family, my peers, and my community. In addition, it has unlocked doors within me that I never knew existed, leading me to an entirely new level of emotional comprehension of music. Learning about the how and why of different pieces’ compositions has helped me form stronger connections with composers and their intended messages. The results of these changes in my relationship with music have been life altering, adding a new source of passion and self-expression to my life. MLC has taught me to listen, love, and, most importantly, love listening; this is the power of the Music Listening Contest, to both highlight the beauty of human individuality and reveal that, amidst a cloud of hijabs, kimonos, face paint, turkey feasts, and fezzes, we humans all have so much in common.